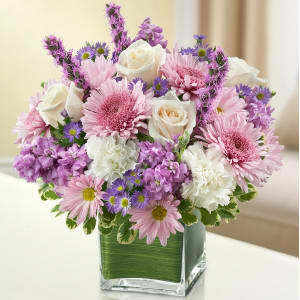 • Elegant lavender and white arrangement of roses, stock, liatris, cremones, carnations, daisy poms and monte casino, accented with variegated pittosporum. Flowers will be received by a Charles O. Dimond Funeral Home's staff. 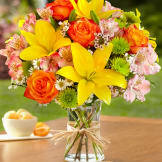 All of our flowers are designed and delivered by hand from a local florist in in South Fork.